The essence of music education is to develop an appreciation of beauty, not simply in music but in life itself. At Ipswich High School and Middle School we strive to develop this aesthetic sensitivity in our students using creative musical experiences as our tool. We use standard teaching techniques, together with analytical, judicial, and creative thinking. Through these processes, students discover the true nature and inner relationships of the music they perform. They learn to make value judgments about the different types of the music they hear and play. They learn to craft their performances and develop a sense of themselves as musicians. Music at Ipswich High School is offered to students as elective courses designed to meet the needs of various levels of ability and interest. Some students choose to perform in one or more of the performing groups because they plan to make music a career. Others participate because they view it as an avocation they will carry on as adults in various community and church performing organizations. High school students can choose to participate in Concert Band, String Orchestra, Concert Choir, and Treble Choir. Bel Canto, Chamber Singers, Jazz Ensemble, Symphony Orchestra, Wind Ensemble and Chamber Orchestra provide further opportunity for the more skilled students who must successfully audition to participate. At the Ipswich Middle School, students can elect Band, String Orchestra, Sixth-, Seventh-, or Eighth-Grade Chorus, and Boys’ Chorus. Auditioned groups include Select Chorus, String Quartet and Jazz Ensemble. 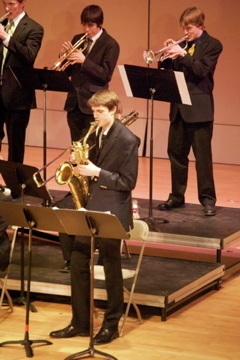 In the high school, the non-performing music electives are Contemporary Electronic Techniques in Music, Music Theory, and Jazz Improvisation. Electronic Techniques students work with Macintosh computers, keyboard synthesizers, drum machines, and sequencer software all networked through MIDI. They utilize contemporary sound design techniques and traditional music theory to compose music. Music Theory students learn the elements of music and develop basic skills such as sight-reading, rhythmic dictation, and composition. Jazz Improvisation is open only to those enrolled in Band or Orchestra. These students study and perform twentieth-century American music, ranging from African-American jazz to rock and popular songs. Students perform in small combos emphasizing the various jazz styles and improvisation. IHS Chamber Orchestra playing at Symphony Hall in Boston as part of the 2015 MICCA Gold Medal Showcase concert. The piece is Serenade for Strings; II. Larghetto by Edward Elgar. Here is a clip of the High School Chamber Singers performing the 16th century Spanish Christmas carol, Riu, Riu, Chiu, arranged by Noah Greenberg. The Chamber Singers are conducted by Choral Director, Jeffrey Patch. Enjoy! Ipswich High & Middle School music students who successfully audition participate in the Massachusetts Music Educators Association (MMEA) Junior & Senior District Festivals. These students compete with students from 71 schools in MMEA's Northeastern District for spots in the chorus, jazz band, orchestra and concert band. The three-day festivals culminate in concerts held at various high schools. Some students are also selected t participate in the All-State concerts. Learn the proper concert attire for your musician.